Amid tense debate on the future of Confederate statues around the US, business appears to be booming for a major Confederate flag manufacturer in Huntsville, Alabama. Alabama Flag & Banner – described as one of the last remaining confederate flag makers – is benefitting from a surge in demand from US nationalists, according to CBS News. Tensions around the public display of images associated with the Confederacy, the 11 secessionist states that fought to maintain slave society, have increased recently. 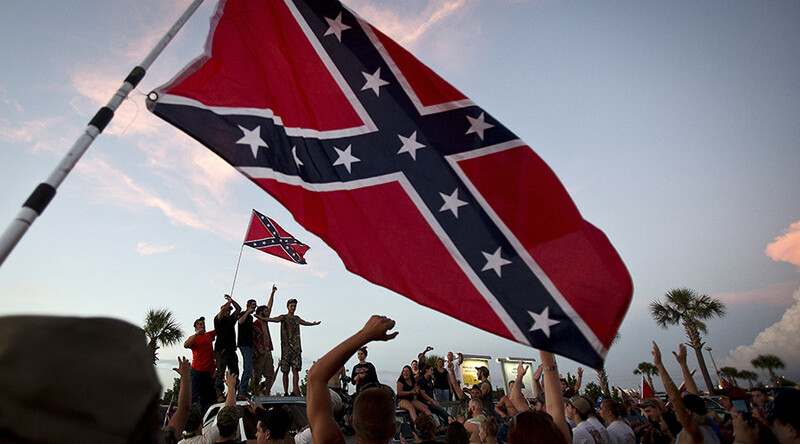 Concern over the flying of the Confederate flag was initially raised in 2015, following the racially-motivated African Methodist church massacre carried out by Dylann Roof in South Carolina. Outrage against the symbol resulted in the flag being removed from the South Carolina statehouse grounds. A rejection of the Southern flag and other Confederate reminders has continued into Donald Trump’s presidency, with some arguing it should be paraded because it is part of US heritage. Fallout from clashes between white nationalists and counter-protesters on August 12 in Charlottesville, Virginia heightened hostilities around Confederate symbols – specifically whether statues to Civil War era figures such as General Robert E. Lee have a place in the public domain. It has resulted in certain statues being defaced and one group of activists tearing down a Confederate soldier statue in Durham, North Carolina, to the dismay of President Trump. But while racial and political tensions continue to bubble, the disharmony appears to have done the coffers of Alabama Flag & Banner no harm. Due to the surge, the firm has had to reroute orders to a different website, and they warn customers that Confederate flags could take up to three weeks to be delivered.